Date of Occurrence: Monday, May 2, 2011 at 9:40 p.m.
Bear- The Delaware State Police have arrested three people after two of them filed a false report of a robbery last night in Bear. The incident began at approximately 9:40 p.m. on May 2, 2011 as troopers were called to respond to the Getty Gas Station located in the 3500 block of Wrangle Hill Road, Bear, for the report of a robbery. When troopers arrived they made contact with Michael B. Davis, 30, and Tiffanie Skidmore, 19, who advised that they had been assaulted and robbed of cash by a subject they knew as Robert Foster and who was currently in the area Delaware City. The investigating troopers responded into Delaware City where they were able to locate and apprehend Foster. Upon further investigation, troopers learned that Michael Davis and Tiffanie Skidmore had lied to them as to what had actually occurred. It was discovered that Davis and Skidmore had contacted Robert Foster earlier in the evening and agreed to meet him on Washington Street in Delaware City in order to buy drugs from him. After obtained several Percocet pills from Foster, Davis and Skidmore drove off without paying for the drugs. 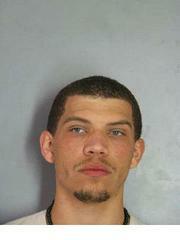 Foster then followed the pair to the Getty Station where a physical altercation took place. During the altercation, Michael Davis displayed a hunting knife at Foster as Skidmore swung a baseball bat at him. Foster then fled the area. Davis and Skidmore then called 9-1-1 and falsely reported that they had been robbed. Davis, Skidmore, and Foster were all arrested and charged with the above list of crimes. They were then arraigned at JP Court 11. Michael Davis was released on $6000.00 unsecured bail. 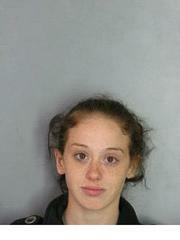 Tiffanie Skidmore was released on $1500.00 unsecured bail. Robert Foster was released on $500.00 unsecured bail.